Health trends come and go, but there’s one trend that looks like it’s here to stay. You’ve probably noticed the proliferation of “dietary supplements” and “weight loss” products being sold by friends of friends on social media, products so sketchy we have to use quotes. These companies recruit people like you to become ambassadors or affiliates, buy large quantities of highly questionable (and often dangerous) supplements, then try to sell them on social media with weight loss promises. These scams somehow manage to combine both get-rich-quick schemes and weight loss scams into a single Facebook post. The word “natural” is vague enough that virtually anyone can get away with printing it on a label. If you’re the type of person who thinks carefully before putting something in their body, then you deserve a natural product that actually earns the name. That’s why we make organic cold press juice for our customers. Because when we say “natural,” we mean it literally. We make all our organic juice on site with fresh produce, like Dr. Greenthumb (green apple, cucumber, spinach, kale, and other greens), Inferno (carrot, orange, lime, cilantro and jalapeno), and dozens more flavors to suit every lifestyle. 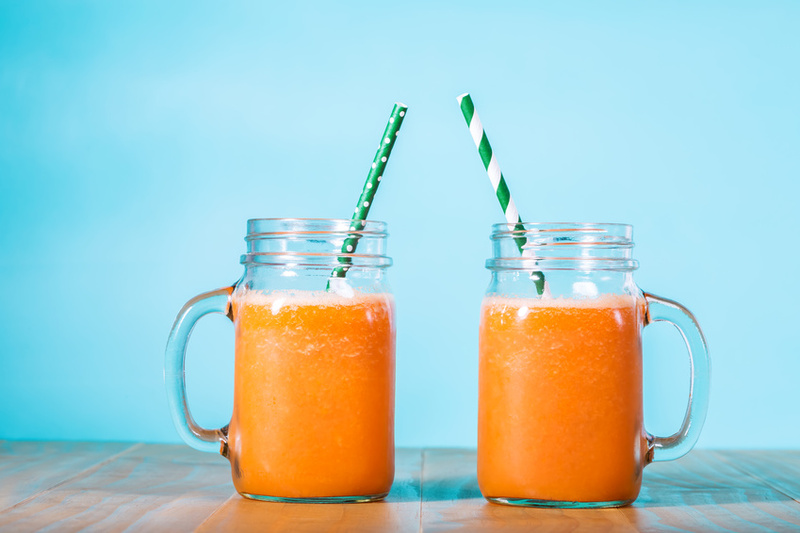 Why Are Organic Juice Cleanses So Important? The human body has evolved to draw all the vitamins, minerals, electrolytes, and energy we need from the world around us, but only if you eat smart. That’s why our organic cold press juice is never processed, never heated, and contains no HPP. Sadly, the U.S. is struggling with an obesity epidemic. Fully 91% of us don’t eat the recommended amount of vegetables, while 87% don’t eat the recommended serving of fruit. At the same time, the average American spends up to 90% of their time indoors, a phenomenon that will only get worse as the temperature drops. And according to studies by the Environmental Protection Agency, indoor pollutant levels can actually be two to five times higher than outdoor pollution! In fact, that’s why the EPA called indoor air pollutants a top-five environmental risk to public health. While you can’t always control the external environment around you, you can control what you put inside your body. And that’s why countless Americans have fallen in love with the benefits of juice cleanses. Cooldown Juice is committed to serving up the cold press juice NYC families need to fuel a healthy lifestyle. Originally, Cooldown Juice opened to make juice cleanses more accessible to our NYC neighbors, which is why we launched one of the original juice cleanse delivery services, with organic juice delivery to Brooklyn, Queens, Sunnyside, and Manhattan. Normally, when you sign up for a juice cleanse delivery service, you’re getting processed juices packed with preservatives. But when you find a local organic juice press, you can have freshly-made cold pressed juice delivered right to your door. Don’t sign up for a Brooklyn juice cleanse that’s actually shipping in juice from halfway around the world. Demand more. Your body is worth it. Previous post Pumpkin Patch Passion Next post The Rowing Machine – Obsolete or Underrated?